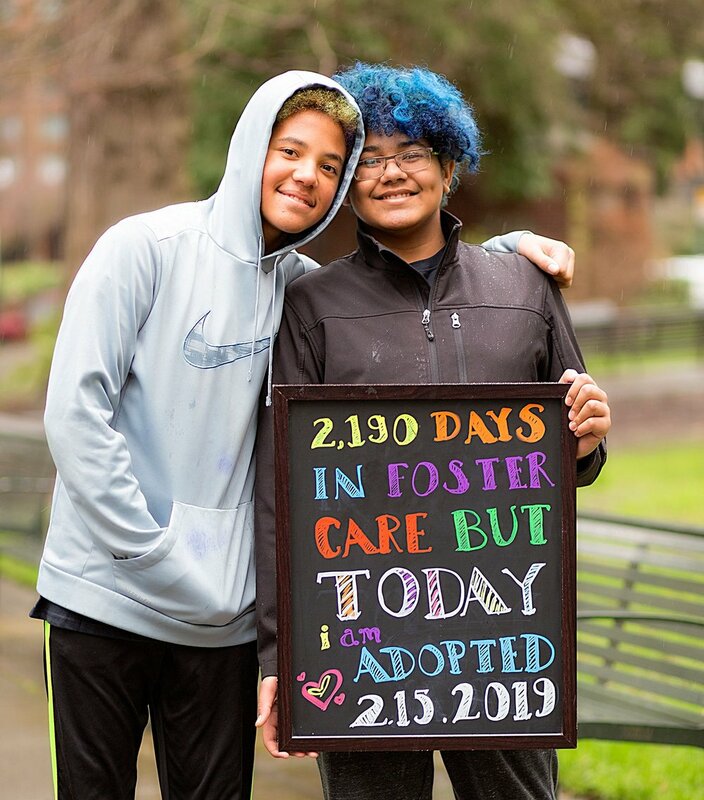 After 2190 days in foster care, Sam finally found his forever family with Anna, Mike and his new brother Orion. Anna and Mike adopted Sam a few months ago through Boys & Girls Aid. 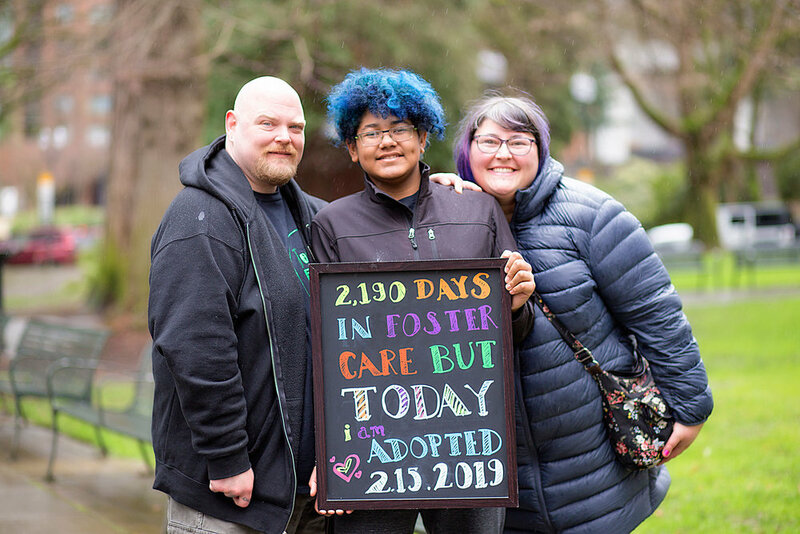 They decided to share their beautiful adoption story with us. I was sitting at home, in my dining room. I had been crying off and on all morning because I knew he was our kid, but I was so afraid we wouldn't be chosen. I'd taken the day off of work because I knew I wouldn't be able to go to work and get anything done. We were so excited and nervous! Mike was at work that day and when I received the call, I instantly messaged Mike with "WE GOT HIM!!!!!" and I immediately cried and laughed and felt so happy and relieved. Our very first meeting with Sam happened at his foster home, which was about two and half hours away from our home. We had planned to meet there because it was quiet and it was his comfort zone. Then booked a hotel room for two nights to spend the weekend with him. When we got to the house where he was staying, he was hiding in his room. His foster mom let him know that we were there, and he came out. I remember Mike and I were sitting on one couch and he sat across the room from us. We said hello and how happy we were to meet him. We made some small talk and he was very shy and eventually went back to his room. We knew that he was a little shy and anxious so we gave him a few minutes and then Mike went in to check in on him and they had a good talk one on one. Every kid deserves to feel safe and loved and have a sense of belonging. These kiddos are precious and worthy of every bit as much love and care as anyone else. Don’t be afraid to adopt an older kid, and if you can’t adopt, support! We had asked a ton of questions to his foster parents prior to the visit, so we knew he loved Taco Bell. We took him there for lunch and then we went shopping for his bedroom. He's a big Minecraft fan, so he chose all Minecraft bedding and accessories. He was very excited to be able to pick his own stuff. Sam is endlessly curious, very affectionate, hot tempered, determined and technically inclined. I love how open he is with his feelings and thoughts. He is thoughtful and really self-aware for his age. He has been really receptive as we've worked with him to teach him things or help him build life skills. Since the placement, I've learned that parenting is the same no matter how the child joins your family. I've parented for over a decade, and expected this to be at least a little different. I was so heartened when I realized that it came so naturally with Sam like it had with Orion. As a couple, Mike and I have learned how valuable communication is and how checking in with each other every day is key. We had done so much preparation ahead of time (reading, seminars, family therapy etc), but it's still different in the moment. Keeping calm when Sam is dysregulated* can be challenging. We've had a few situations where we've had to take turns dealing with a tantrum, or we've had to leave somewhere due to Sam's reaction to things. What was cool for me, was that in training you learn that you could be dealing with some pretty extreme behaviors and that scared us, quite honestly, but in real life, you get through those moments and then realize later "Oh! that's what they were talking about! ", but you're already on the other side of it. In the moment you just do what you need to do for you kid, and then you process later by communicating and checking in with each other each day. Our hope for both our kids is that they are happy and whole and doing something with their lives that fulfills them and they live up to their potential, whatever that means for them as individuals. We love to travel and have adventures as a family, trying new things and expanding our horizons. That can be a big five year plan type vacation (we really want to take them to Europe) to summer camping trips all around the PNW. Every day, we just try to remember to enjoy our life together and celebrate it with them. We’ve been incredibly fortunate to have a wonderful support network of family and friends cheering us on and we are so grateful. Every kid deserves to feel safe and loved and have a sense of belonging. These kiddos are precious and worthy of every bit as much love and care as anyone else. Don't be afraid to adopt an older kid, and if you can't adopt, support!